Aim: This study was done to investigate unintentional solvent exposure in Srinakharinwirot university hospital staffs with unknown etiology. Material and Methods: A multidisciplinary investigation was conducted. 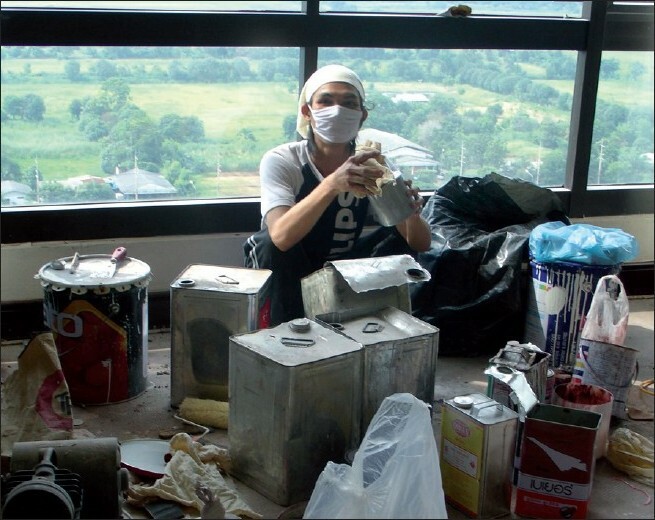 Total volatile organic compounds (TVOCs) in working environments were measured. Biomarkers of exposure and self-administered questionnaires about clinical symptoms were collected, during and after the incidence, from the affected workers. Results: The reason behind this event was found to be renovation of the 15 th floor. TVOCs contaminated the air hanging unit of the lower 5th floor via space of the pipeline system of the building. The average TVOC value in the complaint area, on the date of notification, was 9.5 ppm. The symptoms and level of hippuric acid, collected during the incidence, were significantly higher than those collected after the problems were solved. Conclusions: The solvent from the renovation site was a potential source of health hazards for hospital staffs. The relevant authorities should be concerned about implementing a policy for the prevention of indoor pollution in the hospital. Srinakharinwirot University Hospital is located in Ongkharak district, Nakhonnayok province, which is an agriculture area of Thailand. Its 15-floor building is the tallest in the area. The first and second floors are out-patient departments while the third floor is a laboratory unit. The fourth floor has operating rooms. Fifth to seventh floors have secretary offices, library, conference rooms, and classrooms. The in-patient department is on 8-15 th floor. The 15 th floor, the highest, consists of supporting offices. The building has a central air condition system which is separated into two parts: one is for 1 st -5 th floor while the other is for 6-15 th floor. Early in August 2007, several staffs working on the fifth floor of the hospital notified the occupational health unit. They complained about a foul odor in their working areas every late afternoon for two consecutive weeks with unknown etiology. Some workers also experienced clinical symptoms. This study, therefore, aimed to investigate this event in order to identify the cause and to recommend controls and prevention. A multidisciplinary investigation was conducted by the occupational health team. The concentrations of total volatile organic compounds (TVOCs) in environment were measured by DirectSense TVOC TG502 Multi-Gas photo-ionizing detection monitor. Urine samples for hippuric acid, biomarker of toluene exposure, and self-administered questionnaires for clinical symptoms assessment were also collected at the same time as indoor environmental measurement. This study was approved by the ethical committee of Srinakharinwirot University. Twenty-seven workers volunteered to participate in this study. Two cases were excluded due to pregnancy and vacation. Of all participants, 72% were females. After signing an informed consent, each worker provided the history of solvent exposure and clinical symptoms. Other confounding factors of solvent exposure and its metabolites were also excluded. , The urine samples' and questionnaire collection were repeated 2 months later. Continuous data were described by the mean and standard error of mean (SEM). A paired t-test was utilized in the comparison between the means in the exposure and nonexposure period. Categorical data were described by frequency and percentage. The Mc Nemar test was utilized in the comparison between proportional data in the exposure and nonexposure period. A P-value less than 0.05 was considered statistically significant. The air measurements of all 15 floors showed that only 5 th and 15 th floors were found to have a thinner odor in working environment. By the process of investigation, we deduced that exposure was caused by the renovation of the royal living room [Figure 1] on the 15 th floor. The workers painted and coated doors, wall, and floor with thinner at the same time of detection of odor by affected workers on the 5 th floor. 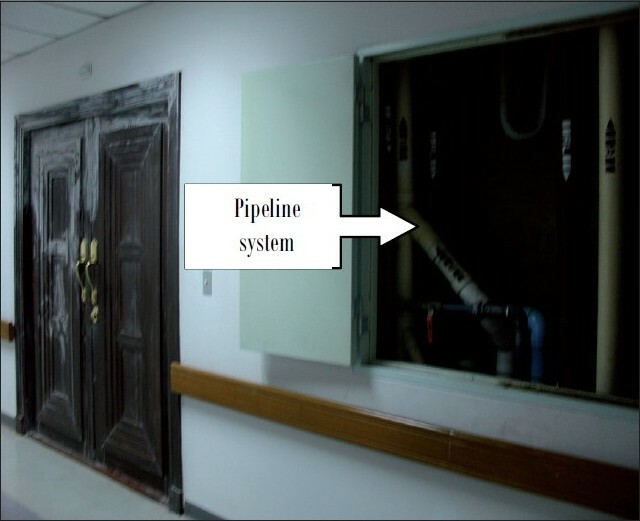 The pipeline system connected between each floor [Figure 2] created some unwanted contaminants' pollution that migrated from the source of the 15 th floor to the 5 th floor of the building due to the closure of local positive pressure ventilation of the top floor. The polluted air was, thus, returned and moved to the longitudinal space of the pipeline system through even the smallest of opening with differing pressures between the two floors. The solvent was recirculated on the fifth floor and contaminated the air hanging unit (AHU) system which was located between the fifth and sixth floor. The indoor environmental quality was directly measured by DirectSense TVOC devices. The average TVOC level of the area of complaint on the fifth floor on the date of problem notification was 9.5 ppm (range 0-10.5). The TVOC levels measured on the day of data collection and after the incidence were both within normal limit. The urine samples were analyzed for hippuric acid levels by the high-performance liquid chromatography (HPLC) method. We selected this marker because the label of solvent containers which were used for renovation showed the main component as toluene, and urinary hippuric acid at the end of shift during exposure period is helpful for monitoring the acute exposure to toluene . The urinary hippuric acid level during the exposure period ranged from 0.9 g/gCr to 2.0 g/gCr (biological exposure index, BEI, < 1.5 g/gCr). The details are given in [Table 1]. 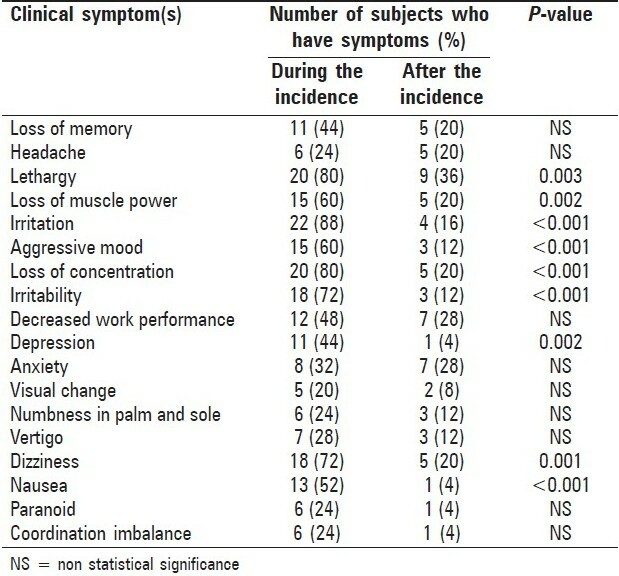 The proportion of clinical symptoms during and after the exposure period, after the exclusion of selected potential confounders, is shown in [Table 2]. Most of the affected individuals complained of irritation (88%), lethargy, loss of concentration (80%), irritability, and dizziness (72%). However, there was no association between clinical symptoms and the level of urine hippuric acid. This study was an example of an indoor air pollution problem in a hospital. It illustrated the unintentional solvent exposure in indoor environment. Solvents and other chemicals used for renovation and furnishings are a typical cause of indoor pollution. Not only the maintenance or construction workers but also other types of workers could be exposed to solvents. The biological exposure indices of toluene during the exposed period were higher than the levels without occupational exposure and levels in all other more hazardous occupations from previous studies. ,,,,,,, This level can cause adverse health effects as shown in this study. In conclusion, indoor pollution is becoming a chief priority in the control of environmental threats to workers' health. This investigation suggests that indoor pollution can be a serious problem for indoor environmental quality especially in a hospital. The executive/administrative board of the hospital or relevant authorities should urgently implement a policy for the prevention of indoor environmental quality degradation. The identification and investigation of environmental risk factors, and occupant's concern, before they become real problems are needed. This project was supported by a routine to research (R2R) grant from Faculty of Medicine, Srinakharinwirot University. 1. Perdelli F, Ottria G, Cristina ML, Lombardi R, Sartini M, Spagnolo AM, et al. Evaluation of environmental contamination by glutaraldehyde in an outpatient facility for digestive endoscopy in an Italian hospital. Int J Environ Health Res 2008;18:73-8. 2. Nayebzadeh A. Exposure to exhaled nitrous oxide in hospitals post-anesthesia care units. Ind Health 2007;45:334-7. 3. Lό H, Wen S, Feng Y, Wang X, Bi X, Sheng G, et al. Indoor and outdoor carbonyl compounds and BTEX in the hospitals of Guangzhou, China. Sci Total Environ 2006;368:574-84. 4. Kang MS, Hong JR, Gil HW, Yang JO, Lee EY, Hong SY, et al. Benzene and toluene concentrations in a hemodialysis room in a medium sized South Korean city. Korean J Intern Med 2008;23:111-5. 5. Hellgren UM, Reijula K. Indoor-air-related complaints and symptoms among hospital workers. Scand J Work Environ Health 2006;2:7-9. 6. Ekpanyaskul C. Jiamjarasrangsi W. The influence of indoor environmental quality on psychosocial work climate among office workers. J Med Assoc Thai 2004;87:S202-6. 7. Ekpanyaskul C, Jiamjarasrangsi W, Kesornthong S. Prevalence, associated factors and impact of sick building syndrome among office workers in Bangkok. J Health Sci 2005;14:453-63. 8. Baelum J, Lundqvist GR, Mψlhave L, Andersen NT. Human response to varying concentrations of toluene. Int Arch Occup Environ Health 1990;62:65-71. 9. Munaka M, Katoh T, Kohshi K, Sasaki S. Influence of tea and coffee on biomonitoring of toluene exposure. Occup Med (Lond) 2009;59:397-401. 10. Wiwanitkit V, Suwansaksri J, Srita S, Fongsoongnern A. The effect of cigarette smoking on urinary hippuric acid concentration in Thai workers with occupational exposure to toluene. J Med Assoc Thai 2002;85:S236-40. 11. ACGIH. 2009 TLV's and BEI's: Based on the Documentation of the Threshold Limit Values for Chemical Substances and Physical Agents and Biological Exposure Indices. American Conference of Governmental Hygienists. Cincinnati, OH, 2009. p. 106. 12. Khunkitti R. Hippuric acid mandelic acid and methythippuric acid level of workers in industrial, Rayong during 2001-2003. Rayong Hosp Med J 2004;3:9-18. 13. Takigawa T, Horike T, Ohashi Y, Kataoka H, Wang DH, Kira S. Were volatile organic compound the inducing factors for subjective symptoms of employees working in newly constructed hospitals? Environ Toxicol 2004;19:280-90. 14. Wang BL, Takigawa T, Takeuchi A, Yamasaki Y, Kataoka H, Wang DH, et al. Unmetabolized VOC in urine as biomarkers of low level exposure in indoor Environment. J Occup Health 2007;49:104-10. 15. Son B, Breysse P, Yang W. Volatile organic compounds concentrations in residential indoor and outdoor and its personal exposure in Korea. Environ Int 2003;29:79-85. 16. Chan CC, Shie RH, Chang TY, Tsai DH. Workers' exposures and potential health risks to air toxics in a petrochemical complex assessed by improved methodology. Int Arch Occup Environ Health 2006;79:135-42. 17. Cheong KW, Chong KY. Development and application of an indoor air quality audit to an air-conditioned building in Singapore. Build Environ 2001;36:181-8. 18. Leung M, Chan AH. Control and management of hospital indoor air quality. Med Sci Monit 2006;12:17-23.